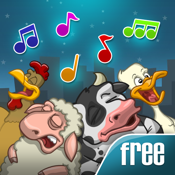 This hilarious memory game uses silly farm animal sound effects that you have to memorize in sequence or a kitty cat falls from the rooftop into the garbage can! Very cute and funny memory game geared towards children 13 and under but lots of fun for parents too! The game gets harder and harder as you get further and further through the correct sequences. Can you do more then 10 sounds in a row? Can YOU Follow The Ditty? Jerry is traveling for a few days and asks his neighbor Martha who lives upstairs with her kitty cat to take care of his pets. FlySmacker, Guess Who - Silly Shadows, Baby Tap & Learn and Toy Store Delivery Truck. Thank you for downloading our apps, we truly appreciate it!